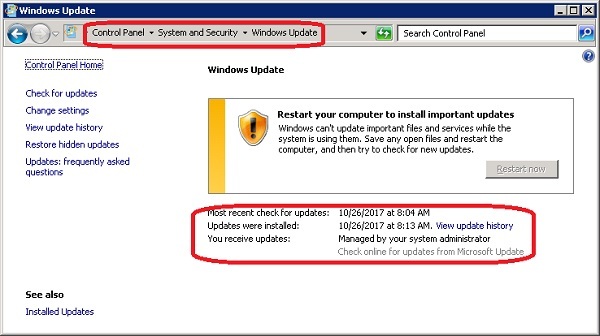 What is Windows Update on Windows Server 2008? Windows Update is a system application on Windows Server 2008 to deliver updates of systems components and drivers. It also provides automatic updating options. Check for updates - Calling Microsoft servers to see if there are any new updates. Change settings - Reviewing and changing settings on automatically checking and installing updates. View update history - Reviewing history of what updates have been installed recently. Installed Updates - Reviewing what updates have been installed sorted by system features and components.